Can you smell that? It’s football season people!! Football is my absolute favorite sport. I watch my Boys every week when they’re on and even when they’re not playing, I have a game on in the background because I just love the sounds of football. But what I really love is the gameday food. You know what I’m talking about. Cheese dip. Pigs in a blanket. 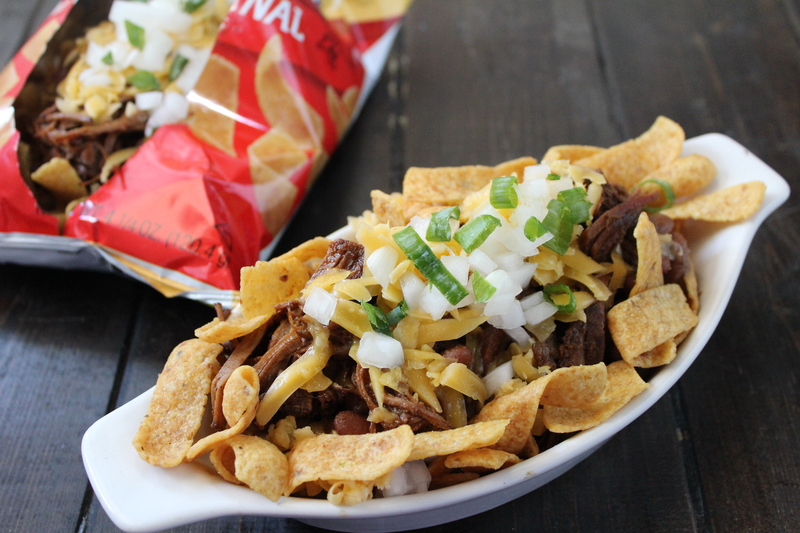 Frito Pies. I was in Elgin last weekend picking up some sausage. Ok, I was there both Saturday and Sunday picking up sausage. And on one of those visits I was waiting in line perusing the menu when an item caught my eye – Ranch Hand. 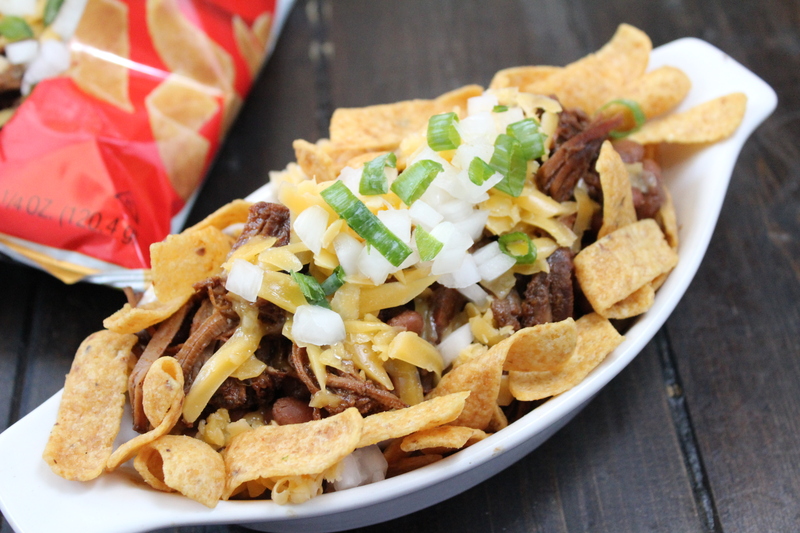 Imagine beans, brisket, cheese and onions all piled in a bowl. 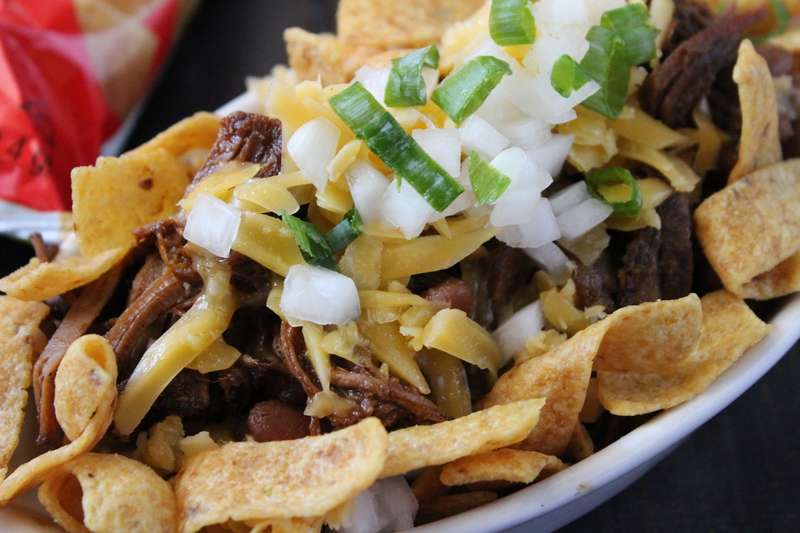 Served with corn chips. Only I got home to find they forgot to give me corn chips so I had to suffer and eat it with a fork.This was one of those those dishes that I made everyone in the family take a bite. It was that good. Growing up, every Sunday was spent on the couch watching football with my dad. To this day I still call him after big plays and say “did you see that?!!”. We always have to have a rundown of the game and I hate that I wasn’t there with him for the first game of the season. But this dish helped me get through it. Fill large stock pot with 8 cups of water. Add 3 Tbsp salt to water. Drop in beans and let soak for 8 hours or overnight. When ready to cook beans, drain from water. Return beans to pot and add in chicken stock, tomatoes, spices, onions and enough water to cover beans by 2 inches. Stir together and bring beans to a boil. Reduce heat to simmer and cook for 4 hours, adding water when needed. Combine spices. Season both sides of brisket with spices. Place about half of Worcestershire sauce and liquid smoke to slow cooker. Add brisket and pour remaining sauce and liquid smoke to brisket. Cover and cook on low for 9-10 hours, turning once. Cut brisket and return to sauce. 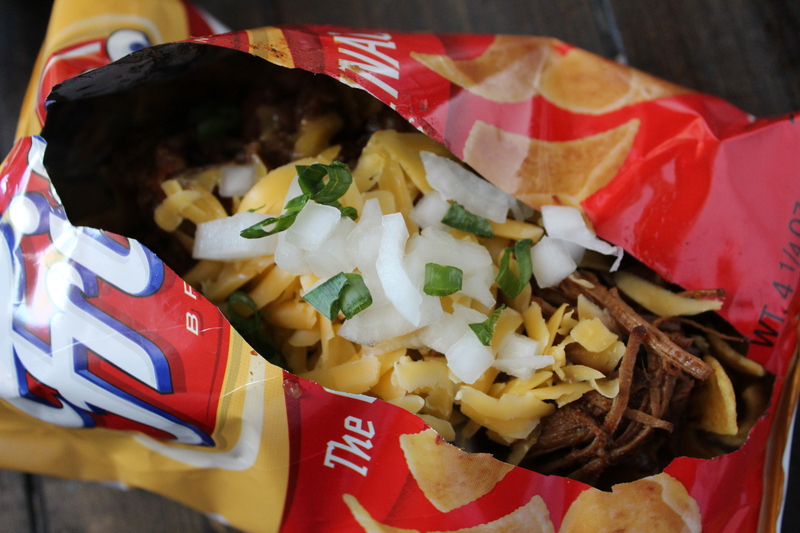 When ready to compile Frito pies, open bag either from the top or down the middle. 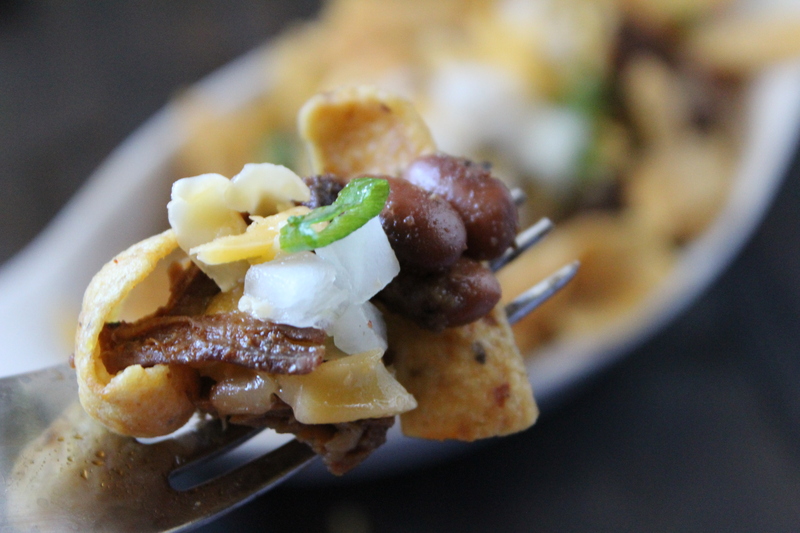 Add a ladle of beans, top with brisket, cheese, onions and green onions or chives. Cheese will start to melt from the heat of the meat.